Running EmBIO Fertility Center in Athens, Greece since 1996, fertility specialist Thanos Paraschos has aided in the conception of more than 10,000 babies. In 1989 he took part in the team (T. Paraschos, J. Soussis, J.C. Harper, E. Kontogianni, D. Packham, A.H. Handyside) that performed the world’s first preimplantation genetic diagnosis at Hammersmith Hospital, alongside Lord Professor Robert Winston. As a Senior IVF Coordinator (1993-1995) under Robert Winston Thanos Paraschos, along with Raul Margara and Karin Dawson, Thanos Paraschos faced an important challenge: A number of embryo transfers were bound to fail due to the patients’ anatomic irregularities (bent cervix, false passages, acutely antiverted and retroverted uterus, fibroids obstructing the cervical canal). To overcome this problem, Thanos Paraschos designed the rigid Wallace catheter used ever since by thousands of fertility specialists and fertility clinics around the world. The rigid Wallace catheter made embryo transfer possible for millions of women with genital irregularities, increasing IVF pregnancy rates internationally. In 1995 the Wallace Stylet was used for the first time at Hammersmith Hospital by Thanos Paraschos, at the time supervising the hospital’s In Vitro Fertilisation Programme as a Senior IVF Coordinator under Lord Professor Winston. During the same time, the fertility team at Hammesrmith Hospital realized they needed to see the path followed by the embryo catheter. Up to that point, all embryo transfers were performed blindly solely based on the gynecologist’s experience. It was then that Thanos Paraschos introduced the ultrasound assisted catheter for embryo replacement. The sonar-reflection-guided embryo transfer catheter is since used by an increasing number of embryologists, further increasing pregnancy rates worldwide. As a Senior IVF Coordinator at a Hammersmith Hospital he trained many gynecologists from the UK and around the world in all forms of IVF procedures such as ovulation induction for IUI IVF, egg retrieval, embryo transfers etc. Working with Professor Winston, he also performed tubal surgery via an operating microscope, laparoscopy, and hysteroscopy diagnostic procedures for infertility and tubal surgery. Involved in the daily running of Hammersmith IVF clinic, he performed over a thousand vaginal ultrasound- and abdominal ultrasound scans for follicular monitoring and early pregnancy assessment, as well as numerous postcoital tests, and hysterosalpingography (HSG), laparoscopy, and hysteroscopy diagnostic procedures. 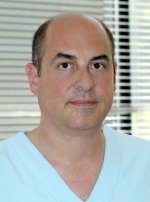 At Southmead Hospital, Bristol, Thanos Paraschos performed numerous tubal surgery and laparoscopy procedures for oocyte retrieval, Gamete Intrafallopian Tube Transfer (GIFT) and embryo transfer. All the above techniques are of great value in the diagnosis and management of early pregnancy, ovarian pathology and uterine pathology problems. Monitoring patients undergoing induction of ovulation, he gained extensive experience in all forms of ovulation induction and superovulation, while performing over a thousand transvaginal oocyte retrievals. His Announcements and Studies on Infertility have been used by thousands of fertility doctors and fertility centers around the world contributing to raising IVF success rates.